Nearly everyone who took UC’s fun quiz celebrating the university’s milestone 150th birthday knew that UC Berkeley was the birthplace of the Free Speech Movement in the 1960s. And that the mighty banana slug prevailed over the sea lion to become UC Santa Cruz’s beloved mascot. But quiz takers were stumped by other questions, especially UC’s connection to the federal Food for Victory campaign during World War I — a question that only 26 percent of participants got right. The 150th Timeline Quiz, which concluded on March 16 after three weeks, was a fun way for UC community members to celebrate UC’s 150th birthday, test their UC knowledge and learn some new facts about the university’s remarkable history and contributions to California and the world. About 3,000 faculty, staff, students, retirees and alumni from all across the UC system took the quiz, which included a link to our digital UC 150th timeline where you can find answers to the 15 quiz questions. Three hundred quiz-takers secured a perfect score and provided a valid UC email address to be entered into our prize drawing. 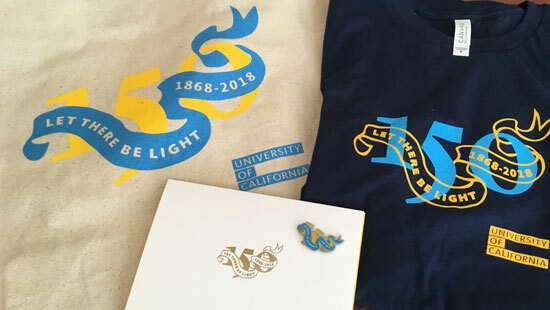 From that group, 25 winners were selected at random and will receive a commemorative 150th anniversary tote bag, T-shirt, lapel pin and set of decorative postcards. If you missed the quiz or simply want to learn more about UC’s history and contributions, visit our digital UC 150th timeline. Congratulations to the winners of the random prize drawing of the 150th Timeline Quiz!